On Saturday August 2, 2014, Senator Tim Scott hosted a Vietnam War Era Veterans Honor Event at the First Baptist Church in Columbia, SC. This was to thank the Veterans for their service during the Vietnam War, as their return was not what it should have been. The Keynote Speaker was Major General James E. Livingston, USMC (retired) who was a Medal of Honor Recipient. Military bands were on hand also. 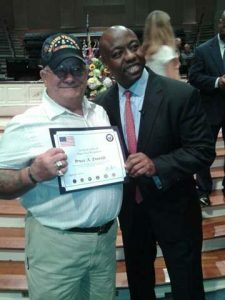 After the ceremony, Senator Scott took the time to shake each and every veteran’s hand and take pictures with them and their families. There were approximately 500 veterans that attended the event. 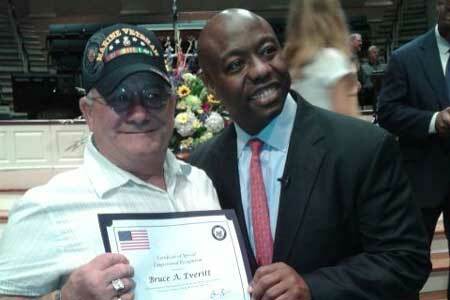 Edgefield’s own Bruce Everitt was among those that received an award and a pin for his service.